Friends, these three vegetables will be perfect in your fall garden, even if you're starting for the first time. Yes, you can grow things in the fall and even some things in the winter. The cold snaps in weather make everything a little bit sweeter and super yummy. I use a version of the Square Foot Gardening format when I garden, in order to get the most I can with the space I have. No matter how you garden, radishes, snap peas and swiss chard have a good success rate because you don't have to baby them. Every time you plant, add some compost to the soil to give the seeds nutrients they'll need. Check the dates of when it's best to plant in your region. In Seattle, August to September is perfect. I also use this online almanac. Now here's the Square Foot Gardening part. I looked up how many seeds per square foot needed to be planted, so that I'm not wasting seeds and use the optimal amount of space. We have a big 10x2 square foot bed in the front where we will be planting the fall fall veggies. There's my husband in the back being a doll and mixing in the compost with the soil that was there from the summer garden. Radishes are smaller root vegetables so I can plant 16 of them in one square foot. General rule of thumb for the depth is plant seeds about twice it's longest side. I put 2 seeds in each hole just in case one of them doesn't sprout. Cover dirt over the seeds and water. I know. Captain Obvious over here, but make sure to lightly pack the dirt, so that when you water, the seeds aren't moving around. If it looks like rain in the forecast, then skip the watering, but seeds need to be moist to start sprouting. For the first few weeks, check the soil to make sure it is moist. Since it's fall you most likely wont have to water everyday because of rainfall. And this is why I love radishes. Only 5 days and look at these little cuties! In the right conditions, you could be eating radishes in about 25 days. Looks like all the seeds ended up sprouting. These need to be thinned out so that there is 1 sprout per hole. If you leave them both in there, they wont survive because they will be fighting with each other, just like siblings in the car on a long road trip. Just gently pluck one out. Now for the snap peas. It's the same deal with the radishes, except you will do 9 per square foot. These are what the sprouts will turn into. Also from my spring garden this year. Ta da! Your lovely seeds will turn into this in about 2 months. Snap peas are vines, so you'll want to make sure you put something next to them that they can climb. If your trellis isn't tall enough, gently guide them back down. Now it's time for the Swiss Chard! This is a plant that really benefits from the cold snaps. If you grow these in the summer, they can easily get a little bitter. These are bigger plants, so you only need 4 to a square foot. What a sight of beauty. The color just pops like a jewel, especially when it can be drab this time of year. The lovely color is a good sign that this is nutritious too, so eat up! 1. Find out when the seeds should be planted in your area. In the Northwest, Aug - Sept is perfect to start your fall garden. 2. 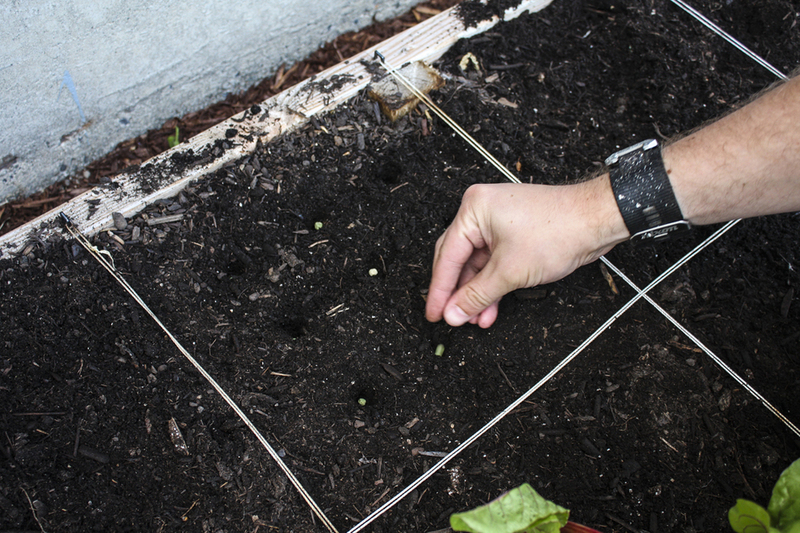 Using the Square Foot Gardening method, figure out how many seeds to plant per square foot. 3. Add compost to the soil that you'll be planting in, to get some nutrients back in that the summer garden used. 4. Plant seeds about twice it's longest side to get the right depth. 5.Cover plants and water until soaked. - If you have extra seeds, save them! You can store seeds, even after the sell by date. Keep them in a dry and cool place. Yes, next to your Merlot would be perfect!